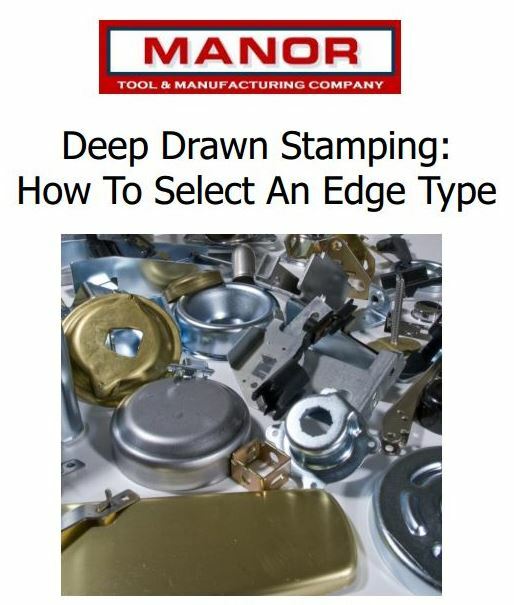 Often in the industrial world, customers can have a hard time deciding the proper edge to use for their deep drawn stamping. There are six types of edges when performing this process; blank and draw with un-trimmed flange; blank and draw with trimmed flange diameter; pinch trim cut; shimmy die cut; flush trim cut; and blank and draw with no flange. When dealing with the blank and draw with untrimmed edge and trimmed flange edge; the choice all depends on whether the flange is important or not. Blank and draw with untrimmed flange: Used when the flange diameter is not important because the edge causes the diameter to become irregular. Trimmed flange edge: More expensive, produces ready to assemble pieces. Blank and draw edge with no flange: Used when side wall edges are not important. The burr side is to the inside of the draw and no secondary tooling required. In addition, it is also used when side wall edges are not important. When dealing with the pinch trim cut edge or shimmy die cut edge, the difference is that one is used when no flange is needed and the other is used when there is need for a clean bottom cut. Pinch trim cut edge: Leaves a slight flare edge around the draw diameter and secondary equipment might not be required depending on diameter, depth, and burr direction. Shimmy die cut edge: Ideal if notches or shapes are required on the open end of the draw and when secondary tooling is required because the burr side is to the inside of the draw. Alternate is the flush trim cut: A cost effective edge to the shimmy cut, secondary tooling will be required in order to obtain a small set radius. In addition, the burr side is to the cup side of the draw. The edge types can also play a major role in the cost effectiveness of the company as well as the time to assemble the part. To learn more and to get a copy of our eBook on the subject, click the button below.